On Tuesday, Comcast announced that in just three and a half years, we’ve connected more than 450,000 families, or 1.8 million low-income Americans, to the Internet at home through our Internet Essentials program. You can read more about this milestone here. We are very proud of this achievement, but know it wouldn’t have been possible without the efforts of committed community partners like the City of Philadelphia, the School District of Philadelphia and the Free Library of Philadelphia. Thank you for your hard work in helping to bridge the digital divide in Philadelphia! 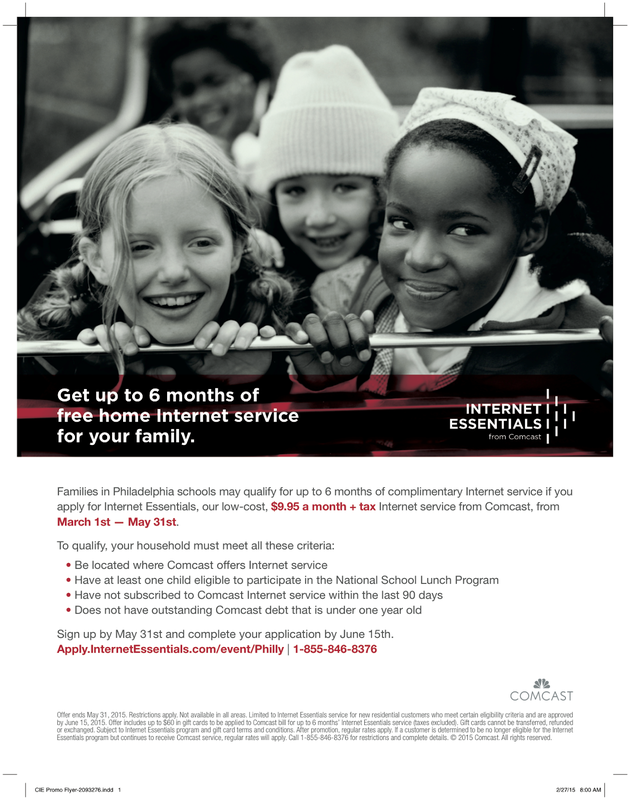 Families in Philadelphia schools may qualify for up to 6 months of complimentary Internet service if you apply for Internet Essentials, our low-cost, $9.95 a month + tax Internet service from Comcast, from March 1st — May 31st. Sign up by May 31st and complete your application by June 15th. If possible, we would appreciate your help in spreading news about this Internet Essentials offer in any way that you feel appropriate including social media (#InternetEssentials, @ComcastFreedom).